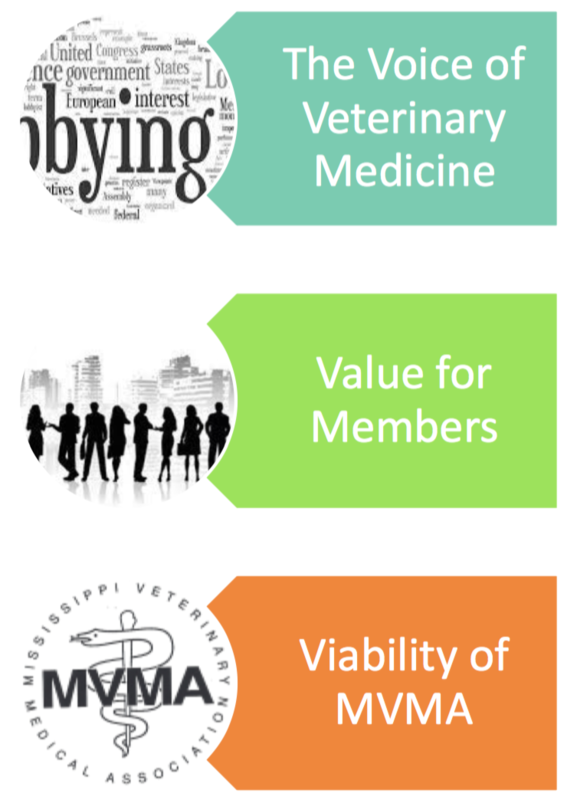 The Mississippi Veterinary Medical Association is a non-profit association of veterinary professionals committed to the advancement of the science and art of veterinary medicine. The Mississippi Veterinary Medical Association has more than 700 members who, through our organization, work together to serve the animals of Mississippi and their owners. The MVMA is the liaison between veterinary medicine and our communities. It is our goal to increase public awareness of the importance of veterinary medicine in disease control and animal health, as well as partnering with our communities to promote and encourage responsibility with pet ownership. The MVMA works with our state legislature to promote the profession of veterinary medicine and protect the animals and owners that we serve. It is the goal of the MVMA to be the association that lawmakers turn to when veterinary issues arise. The MVMA maintains constant surveillance of legislative activity in Jackson, as well as promoting and supporting sound legislation as it affects veterinarians, pet owners and agriculture. The mission and purpose of the Mississippi Veterinary Medical Association shall be to promote the importance of the veterinarian as a medical professional protecting animal and public health.